The Singing Bones by Shaun Tan is the last book on my graphic novel list - this one counts as the 'picture book', though I have to say the designations for each category this time around have been more then a little arbitrary! 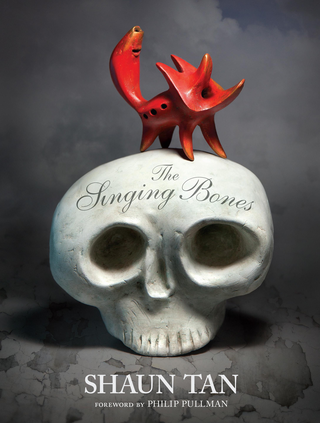 The Singing Bones is not really a book for children. It is exquisite and uncanny, using short extracts from about 60 of Grimms' fairy tales as inspiration for a series of clay sculptures by Tan, best known for his drawings. An afterword states that Shaun Tan was influenced by Inuit and Mexican sculpture, and these weird, wonderful little works cry out to be held in the hand. But I think if I was a young child, I'd find them slightly terrifying. The extracts from the stories, too, many of which were unfamiliar to me, were dark and creepy. Not saying that's a bad thing, but I think I got more pleasure from this book as an adult than I would have as a child. Art Spielgelman's classic graphic account of his family's survival under the Nazis, Maus, was first published in 1973. To my shame, I had never read it, until now. 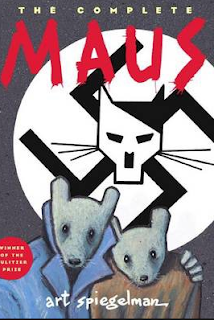 In Maus, and the sequel Maus II, Spiegelman retells his father's account of life in Poland under Nazi occupation during the Second World War. The Jews are drawn as mice, the Nazis are cats, the non-Jewish Poles are pigs. Each panel crackles with energy, as if Spiegelman were scribbling it at top speed, and the story is filled with both tragedy and unexpected humour. Vladek is resourceful, courageous, quick-thinking, determined to survive against horrendous odds. But as he recounts his history to his son, in current-day America, he is also infuriating, comically miserly, irascible, impossible to live with. He is a hero, but not a straightforwardly admirable man. I raced through this book, gobbling it so fast that I barely took in the artwork, focused on the dialogue and the words that propel the story forward. We know (because this is a true story) that Vladek and Anja will live. But plenty of others we encounter along the way will not survive. It's easier to digest the horrors of the Holocaust when it's presented in the form of cats and mice playing out the drama, and it's a story that is so brutal, so hard to comprehend, that perhaps we need a little help to face it. During Maus II, Spiegelman himself reflects on the difficulty of his task. How can he draw Auschwitz? Can he find a way to depict a tin workshop without drawing machinery? Can he do justice to his father's story, and overcome his own feelings of guilt and anger toward Vladek? Does the world even need another Holocaust story? If that story is Maus, then the answer is, yes, it does. 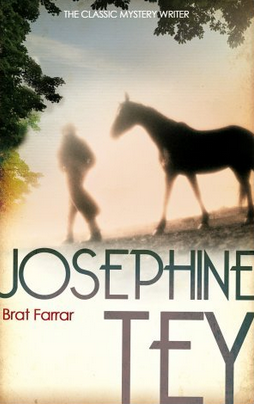 I really enjoyed the fact that this book was set in Melbourne. The graphics gave a vivid sense of the city in the late 30s and early 1940s, and the characters were of a demographic I haven't seen much of -- communists, pacifists, slightly bohemian types -- people who would probably have been my tribe if I'd been alive back then. 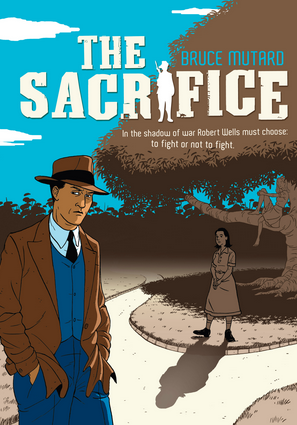 The Sacrifice is part one of an ambitious project, the Robert Wells trilogy, with volumes two and three still to come, which will presumably chart Robert's experiences at war and afterwards; this book deals with his struggle to decide whether or not to enlist. I have to admit that I took quite a while to get into The Sacrifice. If I hadn't had to read it for book group, I might have given up. The start was very dialogue heavy, as the characters discuss politics, religion, duty and ideology for page after page, before I'd managed to distinguish who they were! The story did pick up down the track, though, and by the end I was hooked into the story and the history. I still didn't feel particularly connected to the characters though. Maybe I need more practice with graphic novels as I do find them difficult! But I do admire the ambition of this project. Birthday present! 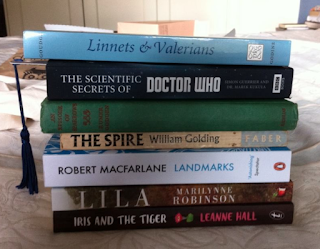 I haven't read Linnets and Valerians for a very long time, and as I read it, it came back to me, like a magic painting's colours when you brush it with water, and I remembered why I adored it so much. Partly it was the character of Nan, who is 'plain,' but still becomes much loved. This was a great comfort to me, and I remembered how much I relished reading about Nan and her private parlour, because she needed time alone, and fierce Uncle Ambrose who nonetheless cares deeply for the children. I loved his owl, Hector, and the bees, and Ezra with his pointed ears who is the repository of old magic, while Uncle Ambrose stands for logic and civilization. It takes a balance of these powers, and the courage and energy and compassion of the children, to defeat the forces of badness in the village and right an old wrong. There were echoes of The Little White Horse in this theme, but I could relate more to quiet, plain Nan than to the confident, self-possessed Maria Merryweather! But... geez, it was slow in patches. Lots of detailed description of the moor and the hill and the woods, which is the kind of thing I normally love, but it was in great undigestible slabs that bogged the story down. The characters were all wonderful, and it was the characters who stayed with me down the years, but this time, unlike LWH, the setting didn't quite catch fire for me. And the solution to the 'mystery' was perfectly plain from practically the first chapter. Still, I'm very glad to have re-acquainted myself with this old favourite (though I wish it still had the original cover), and very content to have it on my shelf. Iris and the Tiger was a gift from my dear, clever Sandra, who provided the cover art. I've been waiting to read Lila since it came out; Marilynne Robinson is one of my favourite authors, and I'm looking forward to a thoughtful, meditative read of the story already partially told in Gilead and Home, this time from Lila's point of view. 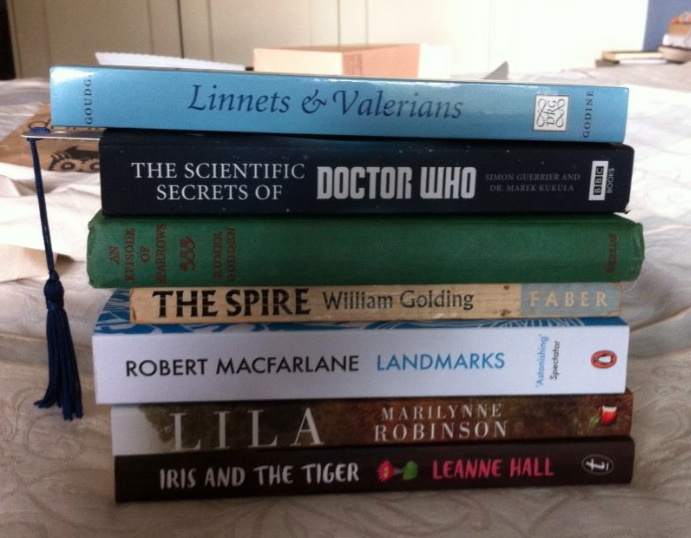 Now my only problem is, which to read first? Oh dear, I'm so easily distracted... I bought this on impulse on the Kindle -- too hurriedly as it turns out, because if I'd investigated further I could have found an even cheaper version -- oh, well, serves me right for being impatient I guess! My interest was piqued because I'd seen Brat Farrar mentioned in Antonia Forest (Ginty picks it up as 'an easy re-read', and I have a feeling it turns up somewhere else as well, but for the moment I can't think where... have to look out for it next time I read the Marlows books...). Published in 1949, it's a classic thriller -- a stranger arrives at the old country estate of Latchetts, claiming to be Patrick Ashby, the long-lost, presumed-dead-from-suicide twin of eldest son Simon. Certainly the two young men look very much alike. But Simon is not convinced -- and he has a very good reason not to believe 'Patrick's story... Can you guess what it might be? I must admit I've been guilty of putting in little 'homages' of my own in the books I write, so it was rather lovely to see that Antonia Forest had done the same! 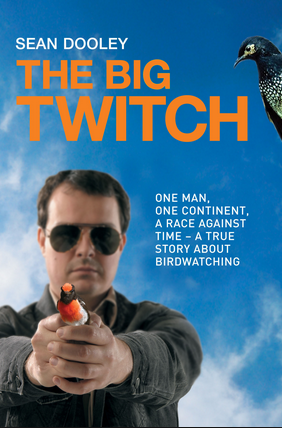 I found Sean Dooley's The Big Twitch in the library while I was vaguely browsing for bird books (for work). It had that well-thumbed look that oft-borrowed books acquire, which is usually a good sign, and indeed so it proved to be. The story of one man's odyssey around Australia, in a quest to see as many bird species as possible in a single calendar year, sounds as if it might yawn-inducingly dull, and in lesser hands, it might have been. But Sean Dooley (who has a history of writing TV comedy) is such an entertaining companion, it becomes a fascinating and funny travelogue, broken into small chunks as he travels into every corner of the country, from Tasmania to Christmas Island and all points in between. He doesn't linger too long on the bird stuff, giving us just enough detail to feel involved in his 'birdy-nerdy' quest, and he weaves in plenty of amusing anecdotes and local history and geography along the way. Who knew that birding politics were so complex and passionate? Dooley's droll eye misses nothing, and he also shares some poignant family history along the way (his journey is made possible by an inheritance from his parents, both recently dead from cancer). In short, I enjoyed this book a lot more than I anticipated. A sweet and drily humorous tale, perfect for reading on the tram.